I fully intended on visiting Lone Fir Cemetery before Halloween, but as I mentioned in yesterdays post, just did not have the time. I was able to visit this past weekend, however, and it was so interesting to wander through the pioneer graveyard and peek into Portlands unique past. A little history lesson now: the cemetery began in 1846 when Emmor Stephens was buried on the family land claim by his son, James. When James sold the property, he insisted that the gravesite be maintained. Eventually, many other people were buried around Emmor, and Lone Fir Cemetery was established after 1866. In 1887, James buried his wife, Elizabeth, here. It is said that he came to visit her almost every day, and imagined that he was holding her hand. 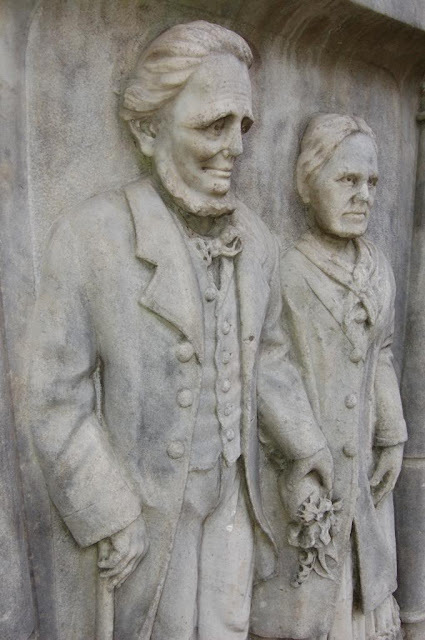 He had a monument carved with likenesses of himself and his Elizabeth, holding hands for eternity. When he passed two years later, he was placed here with her. The monument is probably the most sweet (yet admittedly a bit creepy) grave marker I have ever seen. Oh, I love the story behind this grave marker. That was sure true love. Beautiful history embedded forever in stone. The pioneer cemetery is a fascinating piece of history, what a sad but sweet story of the monument although I too might find it creepy after dark. That is definitely a one of a kind monument. Forever together.